The halberd polearm was a combination of axe and spear allowing both stabbing and slashing actions and was a common battlefield weapon in the 16th and 17th centuries. Whether there were halberd type boarding axes is open to discussion. It was concluded in ‘Boarders Away’ that although halberd axes were occasionally portrayed in marine illustrations from that period, there were few extant examples to be studied and therefore it was unlikely that they were adopted in any number. The spear point would have limited its effectiveness as a tool in making it hard to chop into corners and angles or to swing the axe in a confined space. However, as a weapon there is more use for a spear point and (as already noted) Scandinavian countries tended to regard the axe as more of a weapon. 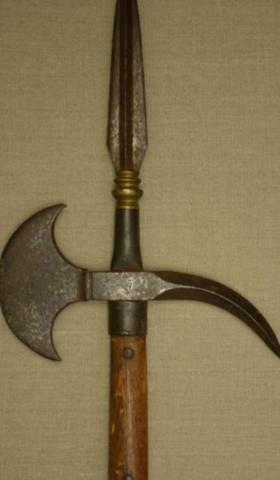 This is demonstrated by early Swedish models including the axe-pistol which incorporated blades with the upper point extended to facilitate a stabbing action. There are also long handled Norwegian boarding axes that include a simple upper spike, which could double as a pike. In any combat with a sword the axe is likely to come off worse. Using an axe, a full length forward thrust is a good way to control space with your opponent and even without any stabbing function this is still effective. It is easy to see why the extended upper blade or the addition of a spear point would appeal to those who considered it should adopt a wider role as a weapon or for joint use as a pike. However, even with the increased resource of the web examples of halberd type boarding axes remain rare and there is no evidence to suggest that they came into common use or were ever adopted as a government pattern. There is no doubt that some private purchase axes were made with spear points and also some with long handles to be used as pikes. 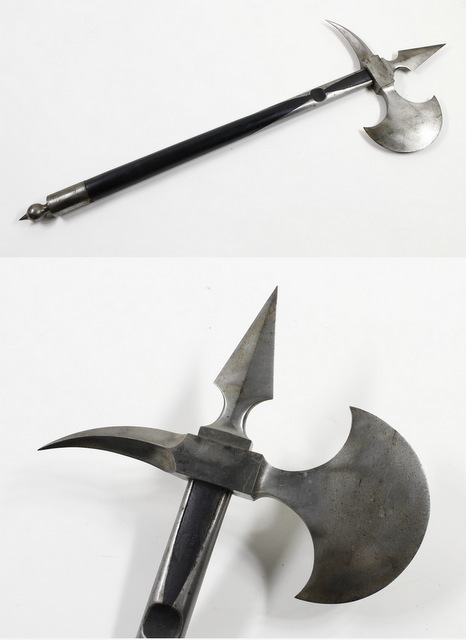 Similar examples of American halberds from the latter half of the 18th century are shown in Neumann’s ‘Swords and Blades of the American Revolution’. Another, pictured right, is described in Rodney Brown’s ‘American Polearms, 1526 - 1865’, as a halberd tomahawk but with a spring loaded socket allowing the fixing of a longer shaft, again from the second half of the 18th century. This raises the interesting possibility that a dual purpose boarding pike/axe existed that could be broken down into two sections with the topmost forming an axe. 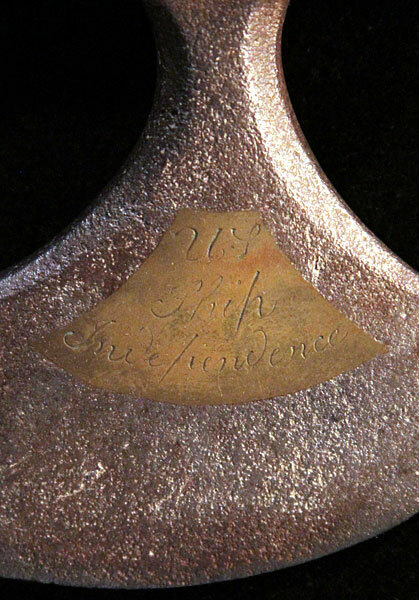 This halberd head is missing its wooden shaft but is clearly marked USS Independence. This was attributed as a boarding axe to the Independence but has halberd polearm features. Note the long tang for internal fitting. It is not known whether a batch was made specifically for the Independence or it is a single commemorative one made for presentation or a special occasion. The engraved initials “E R L” (?) on the centre section are of unknown significance. This is a classic British style axe with the addition of a spear point and with the end of the shaft protected with a closed steel shoe and langets extending up the shaft. Whether this is a modified British axe or made in this configuration is unknown. 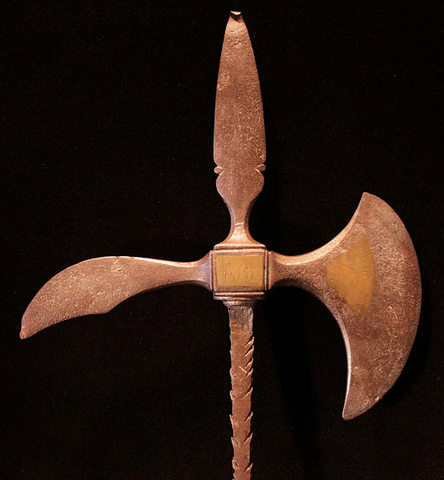 This axe closely resembles the halberd axe as described by the British historian Graham Hunt in note 8 of chapter II in ‘Boarders Away’, although without the markings. The purpose of this axe is unknown but it is a heavy and robust axe, well made with fine materials. Perhaps too well made to be a boarding axe. Perhaps a presentation axe for a French Sapeur General, but this also seems unlikely as there are no commemorative engraving or marks. This axe was described as a boarding axe from c.1820 and it is long enough to do double duty as a short pike. However the lack of langets and what appears to be a single pin attaching the axe head to the shaft would make it unlikely that this was a fully functional boarding axe. Although examples of halberd types axes can be found, there is little to challenge the conclusion drawn by Gilkerson in ‘Boarders Away’. Small batches may have been produced for specific ships or to an individual’s personal preference but there is no evidence to suggest that they were anything other than rarities. 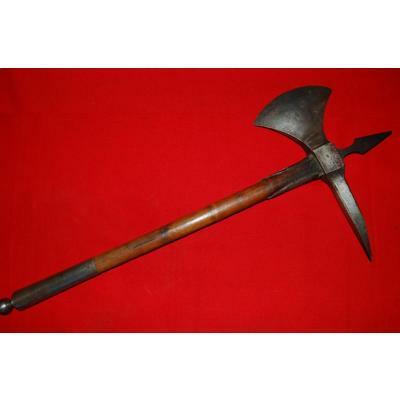 Although this halberd axe has a functional look about it, its purpose may be decorative or for presentation. The spear point only extends a short distance above the top edge of the axe which negates its usefulness. It is also considered that its construction is not robust enough for heavy use or repeated impacts. The metal head is attached to the end of the shaft rather than the wood passing through it. The engraved anchor usually indicates naval use and is similar to those appearing on French weapons. That together with the shape of the axe and the four sided, down turned spike may indicate French origin. A naval captain or admiral being presented on retirement or to celebrate a victory would be insulted to receive a boarding axe rather than a sword as a commemorative gift. However the same would not be true of a sapper officer where often the axe formed part of their insignia so the possibility remains open of axes, embellished with a spear point, given as presentation awards. The axe as a retirement gift is still common today in modern Fire Services. This axe has been described as a French sapeur axe from the 1850s but it is more likely that it is a purpose made halberd boarding axe of French or Spanish origin. Included is this halberd polearm, a full length pike and axe combination, as it utilises the shape of the 1840 Spanish Boarding Axe shown alongside it. The pike is fully functional with the spear point well clear of the top of the axe blade and strongly attached to the shaft by means of a long tang with three rivets. There is no doubt that these weapons were designed to be used and as they are still together it is likely that they were made for a particular ship. The halberd pike is numbered 7 and the axe 47. There are many different types of sapper axes and although most of these have the blade opposed by a hammer there are some that are opposed by a spike that can be difficult to distinguish from a boarding axe. The sapper companies of Napoleonic times were used to build fortifications, trenches, bridges and siege works. They were also utilised as infantry and were armed with bayonet and musket and often short swords as well. Axes for these troops were not regarded as weapons. 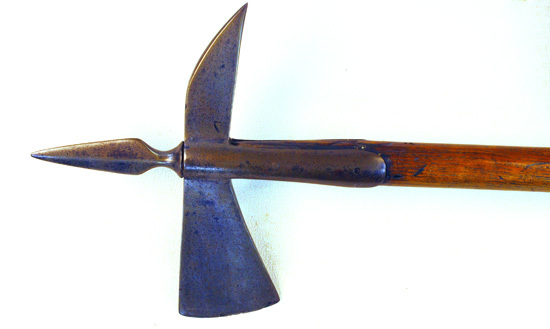 Sapper axes were generally heavy for cutting trees, spitting logs and shaping wood. There would have been little use for the much more tapered blades of the boarding axe which were designed for cutting rope and no reason at all for a spear point. 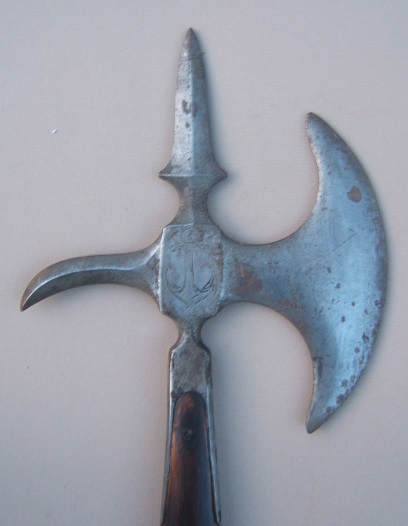 So although some spear pointed axes are described as sapper axes it is more likely that some of them were privately designed and purchased boarding axes such as the example above. There were two warships operating under the name ‘Independence’ in 1776. A 10 gun sloop and a 20 gun brigantine serving in the Massachusetts State Navy. 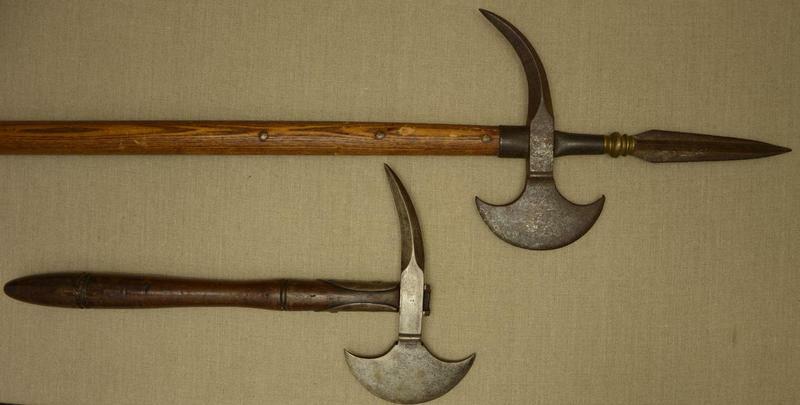 Bearing in mind the difficulty in obtaining weapons in the Revolutionary War it is conceivable that one or both of these vessels were equipped with halberds for use as pikes or cut down for use as boarding axes. 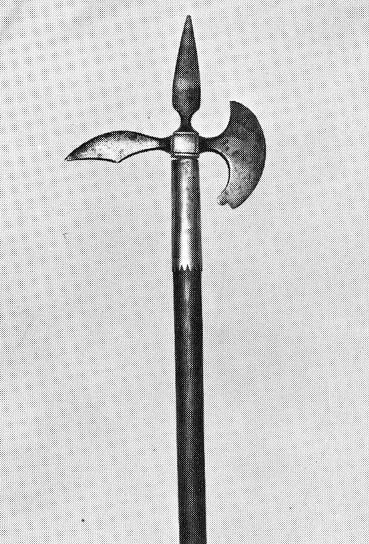 The first American boarding axe did not appear until c.1797 although of course French and British types were available. Similarly during the 1812 war there was a shortage of naval weapons so it is also possible that the later vessel of that name carried some outdated weapons. The USS Independence was a 90 gun ship of the line built in 1814 and the largest US warship of the time. This halberd head, marked US Ship Independence, could have been used full length as a pike or cut down to form an axe or, and this is pure speculation, could have been used as both boarding pike and axe utilising the spring loaded socket described by Rodney Brown. The convenience of having a dual use axe and pike by merely detaching one from the other may well have appealed to nautical minds.